The DDJ-SB3 improves on the renowned DDJ-SB2, which gained a strong reputation with a wide range of DJs from beginners to pros thanks to its combination of professional features and easy portability. The interface of the DDJ-SB3 is even more intuitive to use than its predecessors, inheriting traits from the layouts of the top models in the DDJ-S series including the introduction of the dedicated play and cue buttons, and the independent Auto Loop button. In collaboration with DJ Jazzy Jeff, Pioneer has created Pad Scratch. The brand-new feature on the DDJ-SB3 enables you to reproduce scratches based on the legendary hip hop DJ's own recordings by simply pressing the Performance Pads. Plus, smooth mixing is a breeze thanks to another new feature, FX Fade. You can use these features to create a professional performance, even if it's your first time behind the decks. World's first Pad Scratch techniques recorded by DJ Jazzy Jeff, for easy and unique scratch performances. By simply pressing the Performance Pads on the DDJ-SB3, you can use the Pad Scratch feature to imitate eight different scratch techniques recorded by DJ Jazzy Jeff. Any track that you're playing or have cued up will be scratched, and the scratch speed automatically matches the track's BPM. So even if you have no experience, you can create professional scratch performances without breaking rhythm. Use the feature in isolation or combine it with your own scratching on the other deck for limitless creative possibilities. Using the new FX Fade feature, you can reduce the volume and apply FX to a track at the same time. Whether you're an experienced DJ or a beginner, this enables you to smoothly transition to your incoming track, even if you're playing with different genres of music. There are eight FX patterns to choose from, with two of each of the following types: high pass filter, low pass filter, loop playback and back spin. DJ2GO2 is a portable, pocket-sized DJ controller that goes with you everywhere. 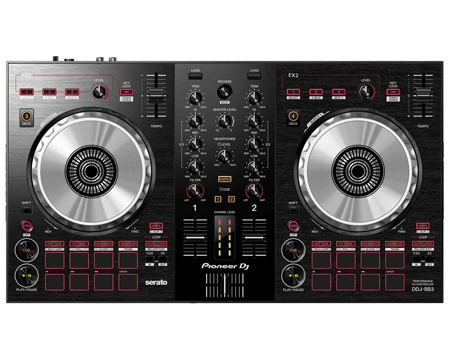 It's equipped with a built-in sound card and Serato DJ intro (Serato DJ upgrade ready), which makes this the smallest DJ controller around. It fits on top of your laptop so you're ready for action in no time, without taking up any unnecessary space. It's perfect for using for small gigs, prepping your gigs, and a great backup for those ?just in case moments. There are endless possibilities, but most importantly, you can go anywhere with DJ2GO2. A built-in sound card with master gain, headphone output for cueing and channel gain knobs makes DJ2GO2 the ultimate portable pocket DJ controller. It has two channels with a crossfader and pitch faders for easy blending. Don't let the small size fool you ?pad modes give you access to performance controls typically found on larger controllers. Conquer your inner DJ with the DJ2GO2 anywhere, anytime and show off your DJ skills anywhere you go! 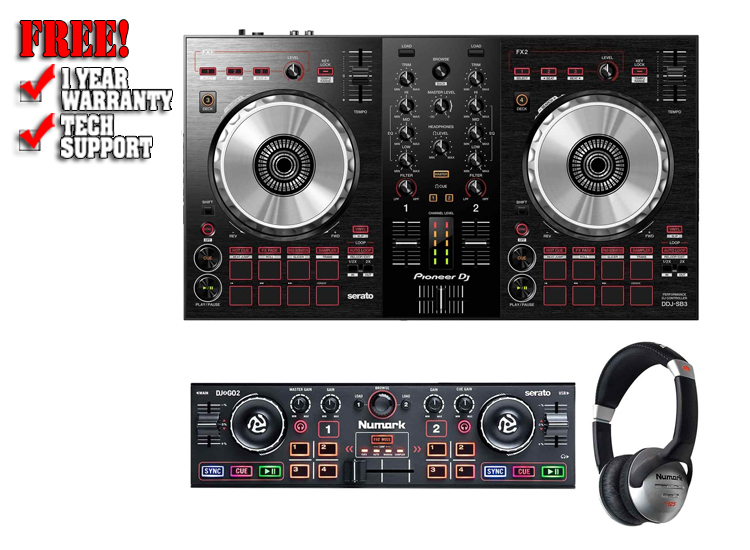 Portable two-channel DJ controller for Serato DJ Intro (included). 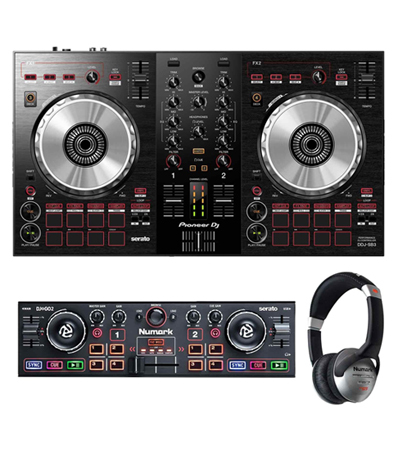 Control the music with play, jog wheels and fader. Built-in audio card with headphone cueing to create the perfect mix. Song navigation and channel and master gain control. Perfect for performing or prepping your DJ set playlist and cue points. Standard midi mapping for use with other popular DJ software. Fits perfectly on top of your laptop. One place a DJ can't compromise is in how they hear their mix. The Numark HF-125 headphone set delivers the goods with flexible 7-position independently adjustable dual ear cups, large 40mm Mylar speaker drivers, 6' tangle-resistant cord with a molded 1/8" TRS connector and a 1/8" to ¼" TRS adapter, and padded headband and ear cups. Serato DJ Lite, Serato DJ Intro, Serato DJ Pro and Serato DJ are registered trademarks of Serato Limited. Mac, OS X or macOS are trademarks of Apple Inc., registered in the US and other countries. Windows is a registered trademark of Microsoft Corporation in the US and other countries. Intel and Intel Core are registered trademarks of Intel Corporation in the US and other countries. The names of companies, product names and technology names mentioned herein are the trademarks of their respective owners.